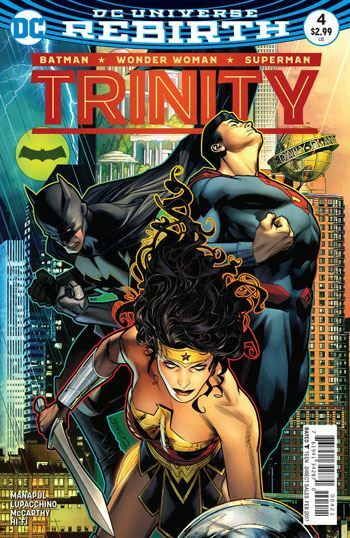 Although much gets explained in Trinity #4, about the alternate pasts that the three heroes are experiencing, the real pleasure in the story lies not in the truth behind the illusions, but in the ride itself. 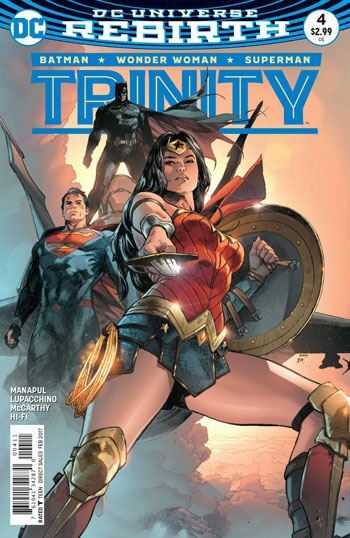 It’s no surprise that this issue takes us, as well as Superman, Batman, and Wonder Woman, to an idealized Themyscira, where Wonder Woman works alongside a younger version of herself. This parallels the previous two issues, in which we saw Smallville and Gotham treated the same way. This is a very subtle reference to the old Wonder Family stories, I do believe, in which Wonder Woman would join forces with younger versions of herself for adventures. And, by accident or design, this also bears a passing resemblance to a recent issue of Wonder Woman’s own book, in which she wound up on a fake Themyscira with Steve Trevor. There is a pleasant surprise, as it turns out that Poison Ivy is not necessarily the antagonist, as she had appeared to be. The true villain of the story is revealed on the final page, while the reason for the various realities is shown, if not explained. One needs a bit of familiarity with the species of alien plant life in the DC universe to recognize the culprit. Another fun chapter, which cannot help but make one eager for the next issue.